If not for Beth Brown, Middle Georgia State University’s respiratory therapy degree might not exist today. Instead, a program that just hit the quarter century mark has produced more than 500 graduates and recently transitioned from an associate’s to a Bachelor of Science degree. Brown, 64, is leaving her life’s work this May for a well-earned retirement that will include kayaking, quilting, and time spent with seven grandchildren. Her legacy is the hundreds of well-educated, critically thinking Middle Georgia State RT graduates who continue to work and lead at medical facilities and other healthcare providers throughout the region and beyond. So Brown became a leader of a group that approached the academic dean of what was then Macon College to develop an associate’s degree program in respiratory therapy. It took a few years and much work, but when the institution was ready to launch the degree in 1994 the administration hired Brown as clinical director. As one of the program’s two charter faculty members, she wrote the initial curriculum and helped set up the labs and classrooms. To date, Brown has taught every student who has come through the respiratory therapy program. Along the way, she continued to influence the profession at the local, regional, and national levels. She was one of the first RT professionals in the nation to complete a master’s degree in cardiopulmonary science. She held many leadership positions, including president, with the Georgia Society for Respiratory Care, served as a state delegate to the American Association for Respiratory Care, and was a director to the National Board for Respiratory Care. Brown reviewed RT textbooks, traveled to India to learn how the profession is practiced there, and worked to ensure stringent licensing requirements for respiratory therapists working in Georgia. Many professional associations and other groups gave her awards for her work related to the advancement of respiratory therapy in practice and as a field of study. 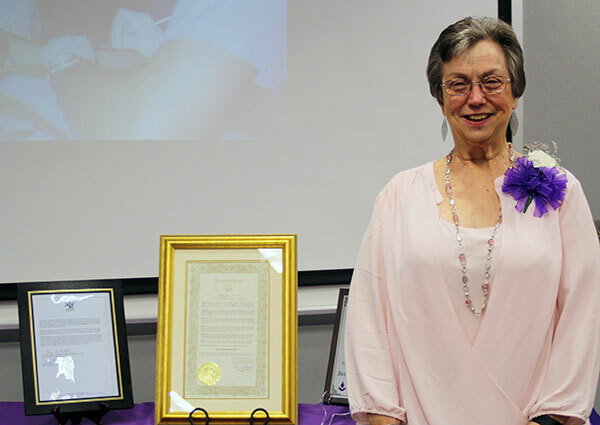 Macon-Bibb County recognized her local impact when Mayor Robert Reichert officially proclaimed Sunday, March 31, 2019 as “Beth Brown Day,” and she received letters congratulating her on her retirement from U.S. Rep. Sanford Bishop and representatives of the American Association of Respiratory Care, among others. As her retirement day approaches, Brown said she feels confident she is leaving the Middle Georgia State program in good hands. Asked to describe some of her proudest career moments, she offered this: her determination to develop zeal in her students to advocate for their patients with physicians, who often are not familiar with the details of care provided by RTs.